Theatre Group Studio (TGS) is a creative environment for actors serious about their craft. All studio members have gone through an audition process to make sure that their needs, and the needs of other members, will be met through the Workshop. This page has some background info on the Studio and the actors who teach there. We encourage you to Contact Us if you’d like more info or to request an interview/audition. We keenly believe in kindness, and we treat each audition with respect. The legacy of TGS began many years ago. Founder Lorinne Vozoff began teaching the Method while still studying it with Jack Garfein at the Actor and Director’s Lab. Mr. Garfein, or “Maestro” to those fortunate enough to have studied with him, is an American film and theatre director. A teacher par excellence, he was the creative driving force force behind The Actors and Directors Lab in both Los Angeles and New York. He was also the artistic director of The Harold Clurman Theatre in New York. He now lives and teaches in Paris. “The first law of the theatre is Action. The second law of the theatre is Action. 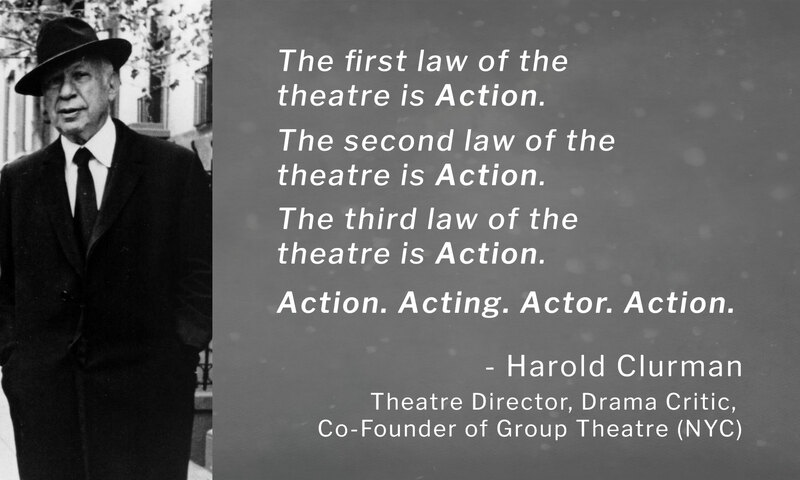 The third law of the theatre is Action. TGS teachers are, first and foremost, Method actors themselves. They understand the Method firsthand, and they keep its practice alive because they believe strongly in its essential artistic merit for actors. They’ve also been teaching it for many years. Lorinne Vozoff is an actor, director, playwright, and teacher. She is also the author of CHANGING CIRCUMSTANCES: AN ACTING MANUAL, a study book used at colleges and universities across the United States. After studying Method acting with Harold Clurman and Jack Garfein, Lorinne began teaching Method acting at Mr. Garfein’s legendary Actor and Director’s Lab. She soon began working consistently in theatre, film and television and continued to teach because of her interest in preserving the Method. Over the years, she’s accepted teaching engagements at LaVerne College in Claremont, California, and at the University of New Mexico Las Cruces. She was a guest artist at Birmingham Southern College in Alabama, where she lectured and performed in MEDEA and THE GLASS MENAGERIE. And, of course, she continues to teach at her own Theatre Group Studio in Los Angeles. In her capacity as the Artistic Director of TGS, Lorinne has spearheaded productions of classic and original dramas, in both a traditional and experimental contexts. In October 2016, she produced and co-directed LIFE MASKS, a month-long run of three one acts with Cuban American playwright Eduardo Machado at the Theater for the New City in New York. And already in 2017, she’s guest-starred in two episodes of the new BET Network hit, REBEL. Keeping busy in theatre, network and cable TV, and feature films, Lorinne has worked with a variety of wonderful actors, including George Clooney, Robert Downey, Jr., Drew Barrymore, Danny De Vito, and many others. Personal highlights of her career include having received guidance from Dame Judith Anderson, which inspired her enormously while working on the prize-winning Los Angeles production of MEDEA. And a long friendship with Henry Miller inspired her to write (and host dinner parties with fantastic conversationalists whenever possible). More recently, she continued her studies of playwriting with Donald Freed, whose encouragement to find relevant social and political themes were especially inspiring. It has never been more true than today that all art is political. Lorinne is a proud voting member of Actors Equity Association and SAG/AFTRA. Her Los Angeles credits include an outstanding performance as Hester in Athol Fugard’s HELLO AND GOODBYE. One critic described her performance as “captivatingly powerful” and suggested that she was a cross between “a young Shelly Winters and Gena Rowlands”.She was memorable as the bewildered, tipsy Natalie in a reading of THE POWDER ROOM at the Loft Studio. She’s worked in traditional theatre and experimental performance art, including Slawomir Mrozek’s STRIPTEASE, with L.A. artists Gronk, Diane Gamboa and Kevin Gunn. For the past 12 years, Kate has taught Technique I of Method Acting at TGS, and is often asked to do private coaching of actors for auditions and performances. And as a leading actor in the Theatre Group Acting Company, she brings her experience and knowledge to the weekly Workshop, as both a teacher and as a member. In addition to acting and teaching, Kate is the author of FATHER Q BALL and an adaptation of THE DEAD by James Joyce. She has also ghost written countless books for interesting people. She can’t tell you about those, however, because if she did, she’d have to…well, you know the expression.